RMB employees enjoying meals at the RMB staff restaurant in Sandton have the added bonus of enjoying some of the large-scale, original artworks, permanently installed and on view in the canteen. 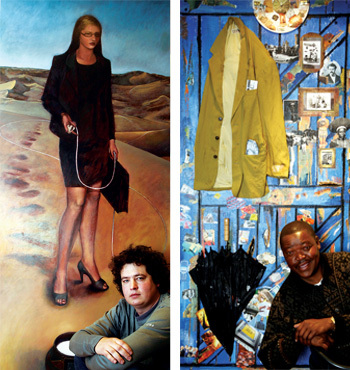 RMB commissioned a mix of young and established artists in 2006 to create pieces of wall-based art in the canteen. In response to the curator’s brief, Johannesburg-based Dominic Tshabangu produced a collage painting on wood using acrylics, gels and found objects, titled Doorway through time. Approaching the assignment from a different angle was Dylan Graham, who lives and works in Pretoria. Using oils on a wooden board, he created Distance, a striking image of a woman in corporate dress wandering through a desert landscape, carrying an electrical cord with a plug on the end. At her feet is a traditional clay pot in which we see an innovatively placed electrical socket. 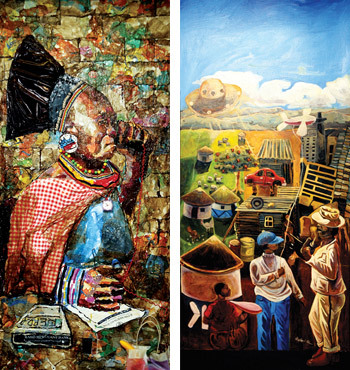 Johannesburg’s Mbongeni Buthelezi has built his reputation on his trademark works crafted from recycled plastic. He created an artwork titled Back to the future for the Project. RMB staff saw artist *Mandla Mabila in action as he painted his mural, Prosperity rising, directly onto the canteen column wall during working hours. An artist with a disability, Mabila dedicated this work to "changing negative and naïve attitudes towards people with disabilities". "Artists with disabilities", he says, "have both a responsibility and an opportunity to politicise and problematise issues around disability." *In memorium. Mandla Mabila sadly passed away earlier this year. RMB sends their condolences to his family and friends.